View the free resources and documents below. Our goal is to educate doctors, x-ray operators, and patients about state regulations and radiation in general. The Colorado Department of Public Health and Environment (CDPHE) requires that each facility housing x-ray machines and each machine is registered. Generally, each facility with radiation machines must register each year. Use this form to register a new facility, or renew or update an existing facility. Use this form to notify the state when a machine is no longer in service at your facility. For newly installed machines, the state requires a report of assembly. One way to do this is to file this form. This powerpoint and companion handout cover the basics of what radiation is, why it can be dangerous, and how to protect yourself when working around it. It is an excellent start to any radiation safety program and/or an annual ALARA review. An article written by Atom Physics’s medical physicist about dental radiation. The state provides a notice to employees that all facilities should post. 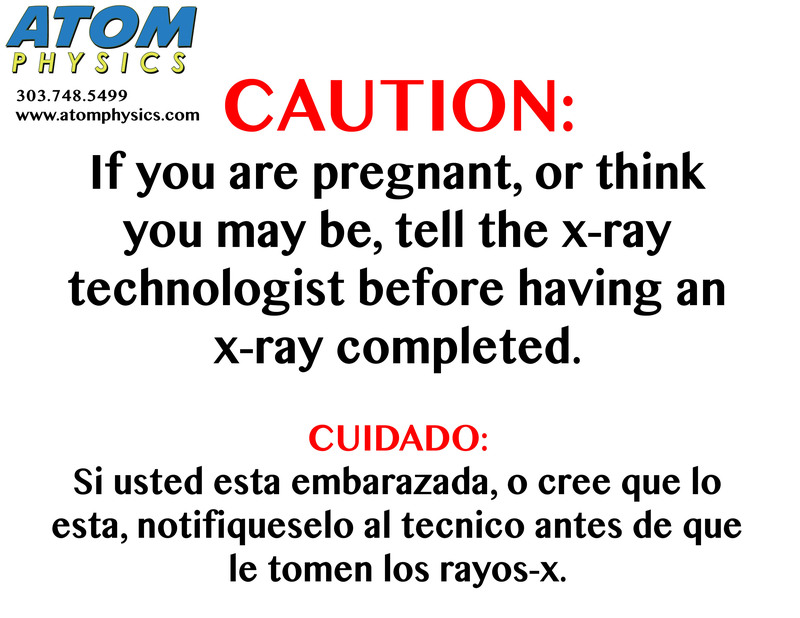 A sign to remind pregnant patients to tell the x-ray technician of their pregnancy.